Updates and Redelivery | Vavoom! From time to time I release updates to the Vavoom! products. It might be a bug fix for something in my code or it might be because something in the VKC™ Dogs has changed or perhaps something in SL has changed. When this happens I send out an update announcement, usually as part of the monthly news service to notify the owners of Vavoom! products. 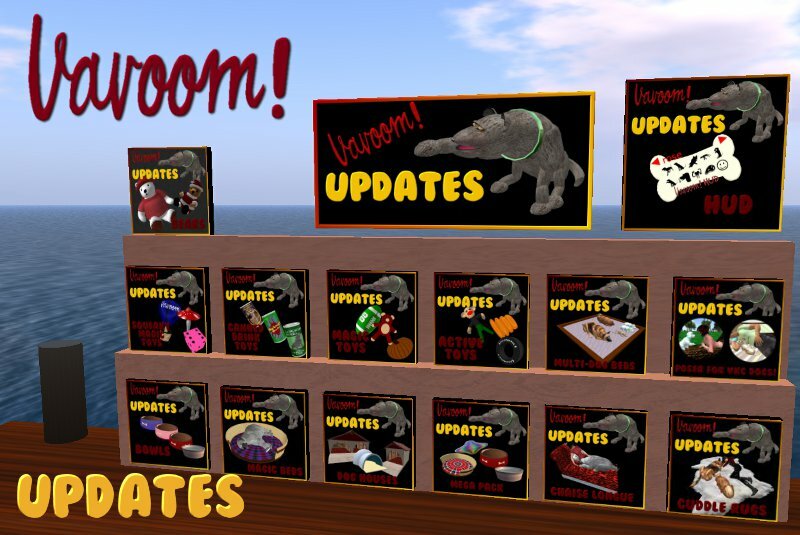 Updates are free and you collect them from the Update Stations on the deck of my Main Store. The Update Stations also double as product redelivery for failed purchases or lost or damaged products and are available 24/7. To collect an update, or have a product redelivered, click on the updaters for each of the various product types that you own: Beds, Houses, Toys, Bowls, etc and the Vavoom! Database will look up which products of each type you own and deliver them to you in a folder.